What products from Malaysia and Thailand are popular on Tmall? We can only predict that brands like Julie's Biscuits, Ah Huat White Coffee are doing well in Tmall as biscuits, instant coffee, chocolate drinks, tea bags are classified under food category here. Even with the launch of DFTZ which supposed to facilitate both imports and exports, many retailers and merchants here are still skeptical as imports (mainly from China) are way more significant than exports. So the question is, can Malaysia take advantage of DFTZ and go overseas? Is made-in-Malaysia fit to export especially via B2C online platforms? Read on as we reveal some interesting findings from Alibaba Research and Tmall Global. Guess what Malaysian products are popular on Tmall? According to Tmall Global, GMV (Gross Merchandise Volume) of Malaysian products in Tmall enjoys a 140x YoY growth in 2016 compared to performance in 2015. The big question here is, what are the top selling Malaysians products on Tmall? 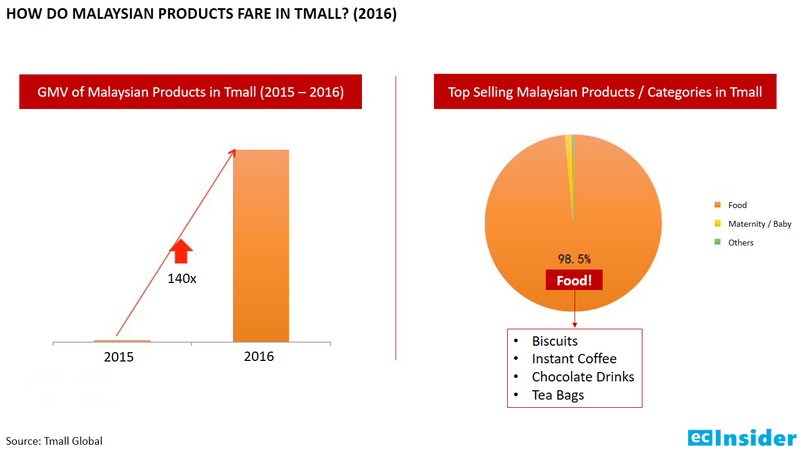 Yes, 98.5% of Malaysian products sold in Tmall last year are under food category, followed by Maternity / Baby etc. Way to go Malaysian brands, Malaysia boleh! But wait, Thailand and Singapore are doing even better than Malaysia in terms of exporting to Tmall among the OBOR countries. OBOR stands for One Belt, One Road (一带一路) also known as The Belt and Road Initiative. For the record, there is a total of 69 countries under this initiative, including China of course. 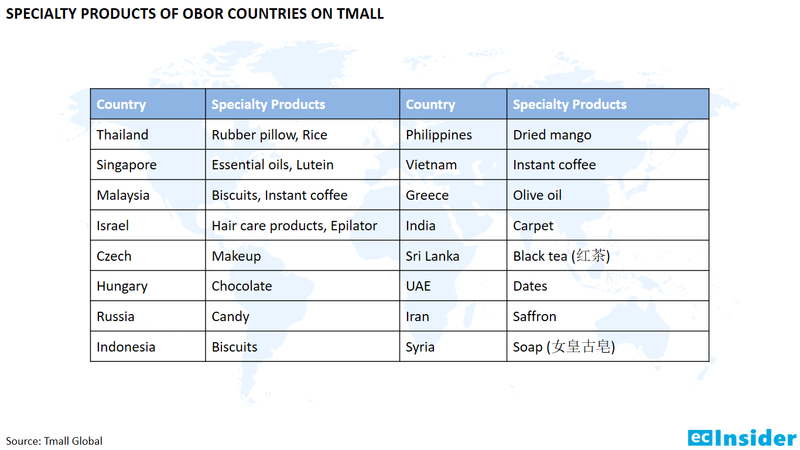 If we refer to the chart above, Thailand is the biggest nation among OBOR countries exporting to Tmall Global in 2016. Alibaba Research has also ranked OBOR countries in terms of E-commerce Connectivity Index (ECI), which is a combination of imports and exports. Russia tops this chart as the most important export market among OBOR countries for China (Buy China products). 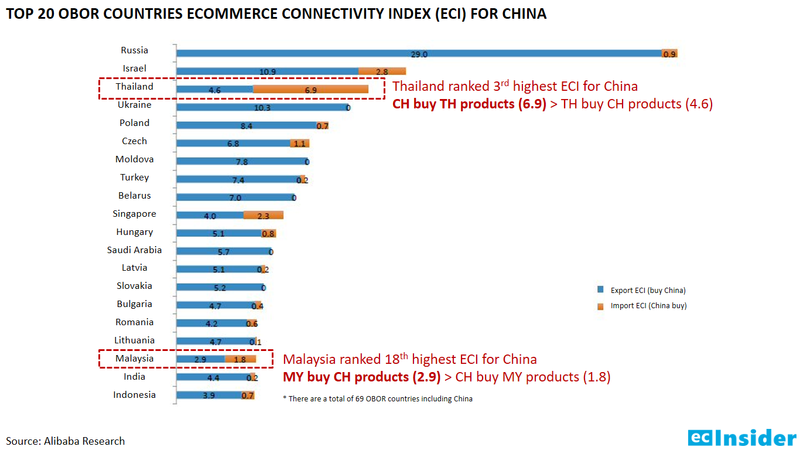 Combining imports and exports, Thailand ranked 3rd while Malaysia is the 18th highest ECI for China. 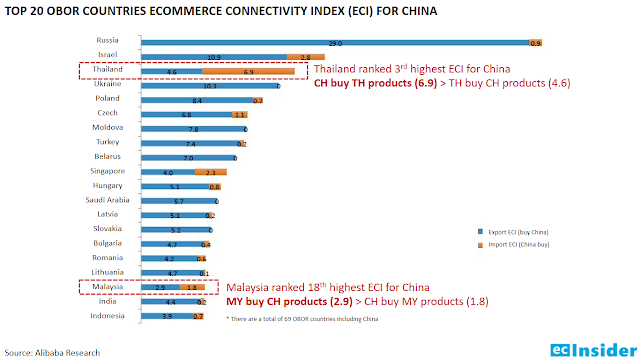 Interestingly, China is importing Thai products more than exporting made-in-China to Thailand, e-commerce wise. For every country including Malaysia, it is the other way around (China exports more than imports). What are the popular Thai products in Tmall? Have you always thought of Malaysia being a big rubber producing country? This is factually correct but Thailand is bigger, in fact, the biggest rubber producing country in the world. 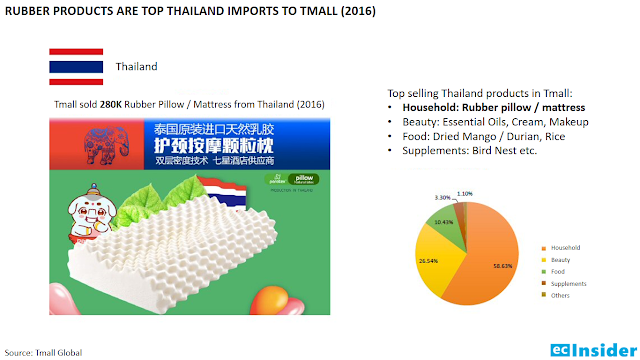 So you've probably got the answer by now, Thai rubber products are popular in Tmall, with 280,000 rubber pillow and mattress sold in 2016. By turning the raw material to rubber products, it's 3 or 4 times more the price. With the steady drop of rubber (raw material) price over the years, the increasing demand from China market has done Thai rubber industry a favour. The question is, how can Malaysia learn from Thailand? Besides rubber products, Thailand is also exporting beauty, food, supplements to Tmall. If you still remember, it is all about food from Malaysia. So, Thailand with its rubber pillow, Malaysia with its biscuits, what about other countries? Let's wrap up here with this list of speciality products from OBOR countries on Tmall. 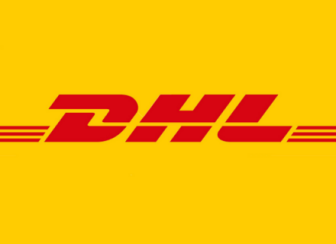 ecInsider: What products from Malaysia and Thailand are popular on Tmall?